Shabtabnews – Numerous Iranian personalities and activists in various social, civil, economic, cultural, legal fields, and human rights activists and civil rights activists, journalists, jurists and thinkers, and political prisoners and their families, and women’s rights activists all have expressed concern about the health of Dr. Noor Ali Tabandeh and they have called for the ending of his illegal and inhuman house arrest. Dr. Noor Ali Tabnadeh, the spiritual leader of Gonabadi Sufis has been under house arrest for almost eight months, after the Sufi protests of February 2018. In the early days of February, Dr. Noor Ali Tabnadeh announced his house arrest via release of a video from his house. 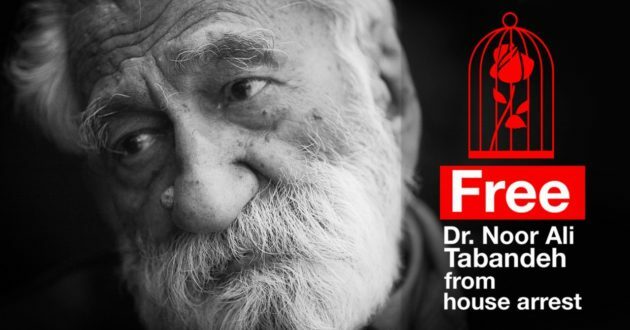 Subsequently, all visits, to the house of Dr. Noor Ali Tabnadeh were discontinued by the security forces, and he has been prevented from leaving his home..
All of the trusted friends, of Dr. Noor Ali Tabnadeh, including his physicians and home help, were expelled from his home, and their connection to the outside world was strictly prohibited. In recent weeks, the alarming news about the state of physical health of Dr. Noor Ali Tabnadeh has caused serious concerns amnogst his friends, activists and disciples. A group of human rights activists have urged the elimination of the barriers to the freedom of Dr. Noor Ali Tabnadeh and sought to collect the signature of Iranian personalities in support of his freedom. Nearly eight months from the illegal encroachment of Dr. Nurali Tabaret, “Majzoub AliShah”, the Nematollah Gonabadi Dervishes quadruple. The imposed conditions for them every day find a wider dimension and pressures increase. Continuing this homelessness, apart from the unlawful aspects of the overthrow and apparent violation of Mr. Nur Ali Tabaret’s indisputable rights and the inhuman use of his followers, can also be medically adversely affected by the consequences of his catastrophic health. The protagonist of this great promise is not worn. Dr Noor Ali Tabandeh is the spiritual leader of one of the largest Sufi orders in the world, the Gonabadi Sufis. Sufism is a spiritual path, dating back many centuries, which encompasses mystical teachings and spiritual practices with the aim of seeking one’s essence within oneself. Having been under House Arrest since 19th February this year, and at the age of 91, Dr Tabandeh is in a delicate and dangerous situation. Many have spoken out about the current plight of Sufi’s and Dr Tabandeh, particularly following the recent execution of an innocent Sufi by the name of Mohammad Salas, which caused International outcry. Some important figures include Mike Pompeo, US Secretary of State, renowned Human Rights Lawyers such as Shirin Ebadi, Hollywood actress Nazanin Boniadi, and numerous MEP’s including Antonio Tajani, President of the European Parliament.